This hotel is set in a quintessential Southern California seaside destination. It boasts uncompromising hospitality along with breath-taking views of Newport Bay. 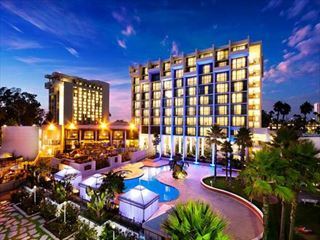 Discover unparalleled beauty and relaxing luxury at the Marriott Newport Beach Hotel and Spa. 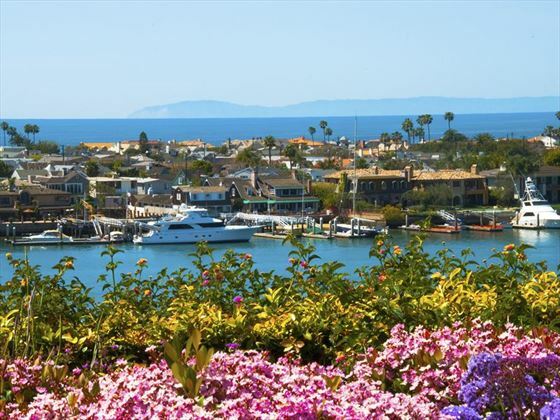 The hotel is located on top of a hill overlooking Balboa Island and the Newport Pennisula for sensational vistas. Renaissance Newport Beach combines European style with California flair in one of Southern California's most affluent and beautiful cities. Featuring refined guest rooms and suites, every aspect is designed to surround guests in complete 'O.C. luxury'. 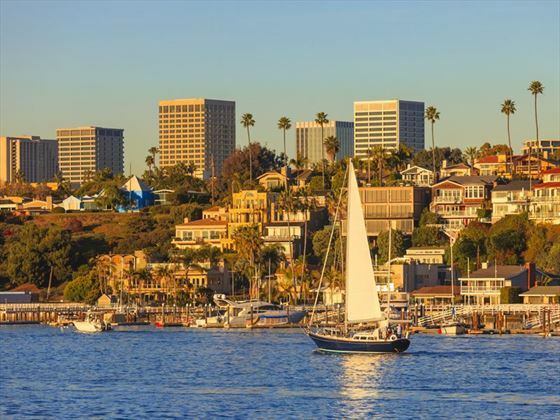 Situated on the California coast, Newport Beach is a beautiful location with a Mediterranean climate, breathtaking beaches and famous harbour. Synonymous with the affluent and indulgent lifestyle this part of Orange County is famous for, the area is not just about flashing the cash. It also perfectly embodies the essence of coastal Californian living: casual, comfortable and active. Californian life is all about making the most of the golden sunshine, and this area is perfect for doing just that. Littered with glorious beaches and parks, there is something for every sort of beach lover out there. 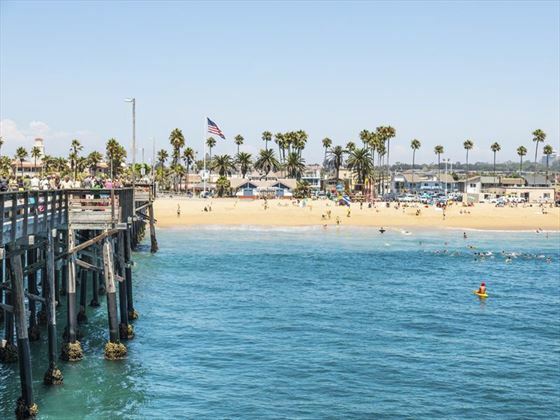 Families should head to the Corona del Mar State Beach, while those with a penchant for surfing should make their way to ‘The Wedge’ at the very tip of the Balboa Peninsula. Not sure what sort of beach you fancy? You can’t really go wrong with the five-mile stretch of Newport Municipal Beach, which offers a bit of everything. If making the most of the waves is your thing, then Newport has plenty of activities to offer. 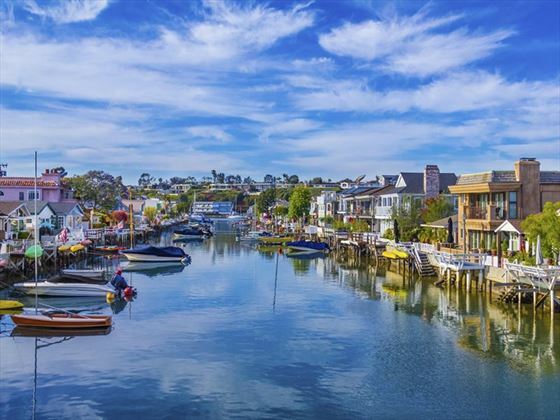 From renting electric boats to taking a ride on a romantic gondola, and from jet skis to whale watching from Newport Landing, this coastal city has it covered. 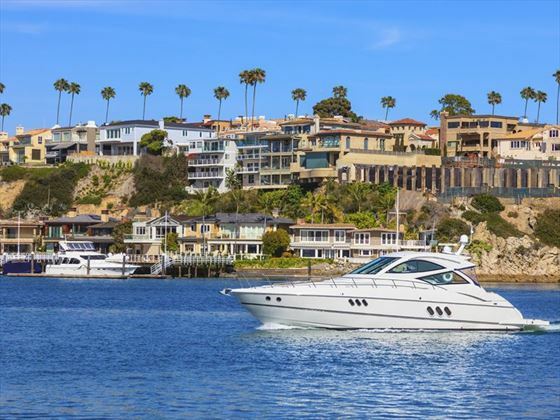 You’ll also find plenty of opportunity to go fishing, sailing, kayaking and paddleboarding from Newport Harbor. This area has even more to offer outdoor-lovers, including golf courses (Pelican Hill offers two, both of which rank among Golf Digest America’s 100 Greatest Public Golf Courses) and ample routes for cyclists (the boardwalk draws in hundreds, while Upper Newport Bay is ringed by a network of trails). 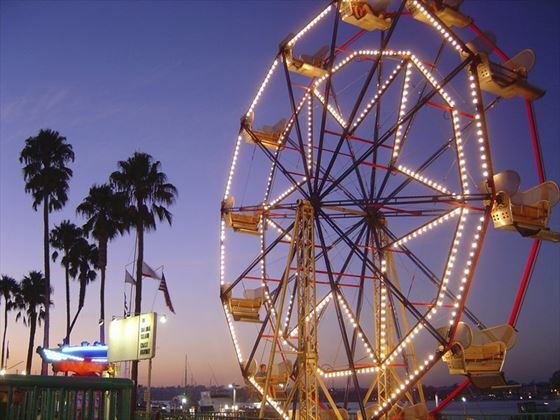 Visitors are sure not to miss the city’s most famous landmarks: the Balboa Pavilion and the Balboa Island Ferry on the Balboa Peninsula. Balboa Village is the home of many of the things that make the city famous: shopping, restaurants, water sports, cultural activities and speciality boutiques. Those who like to come home knowing they’ve learnt a little about the area they’ve visited can investigate the various museums and galleries Newport has to offer, including the Newport Harbor Nautical Museum, the Lyon Air Museum, and the Newport Theatre Arts Center. As the night draws in, visitors can explore the region’s nightlife by checking out the bars and restaurants that surround Newport Pier. Also, every Friday throughout June to October, the Annual Summer Concert Series takes place, showcasing international acts offering jazz and acoustic music. Plus, if you’re not exhausted after all this, Disneyland is only a half an hour drive away. 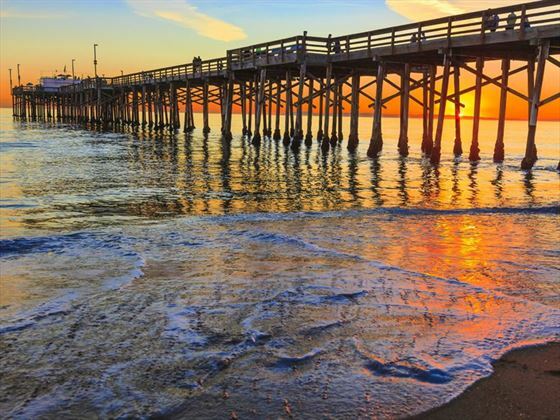 Newport Beach offers an all-year-round Mediterranean climate, but as with all tourist destinations, some times of year are more popular to visit than others. Winter is not what you would call warm, but you won’t need to be reaching for the hat and gloves. Summer (June to September) is by far the most popular time to visit, and the area offers ample accommodation for tourists. If you’re keen to avoid the high-season tourist rush, consider visiting the area in September or October, when you can enjoy the area’s ‘Indian Summer’. 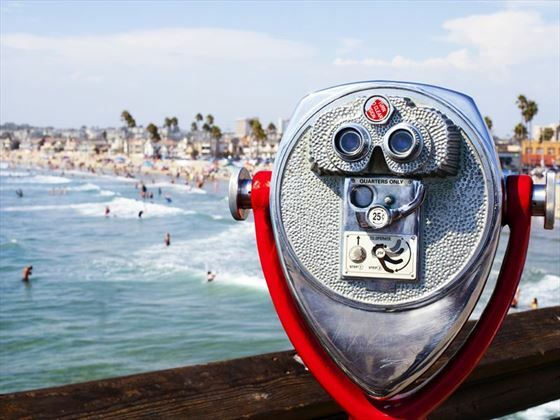 Planning a holiday to Newport Beach? 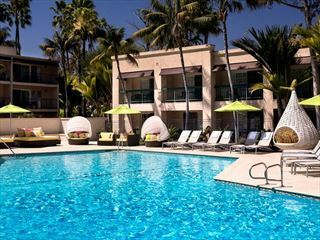 If you are planning a holiday to Newport Beach, American Sky can help you to organise your perfect break. Call our California specialists and make the most of your next trip.